If you have ever attended a world championship motor racing event, you will have noticed the team’s large transporters lined up in the paddock. This is the team’s workshop, spares department, and all round HQ for the duration of the race, and must contain everything that the team may need, as well as provide a strong and professional brand image for the fans to see. 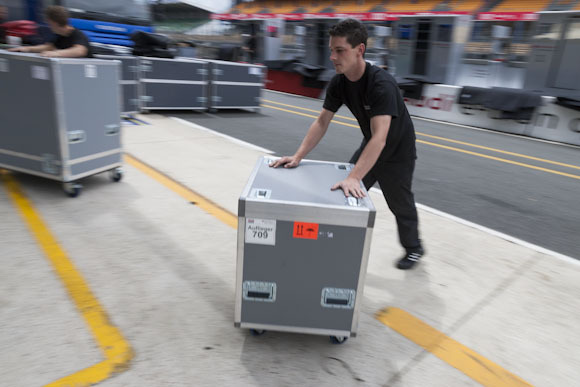 To ensure that the team is ready to commence business upon arrival at a circuit, Audi’s global logistics experts are deployed with pinpoint precision. 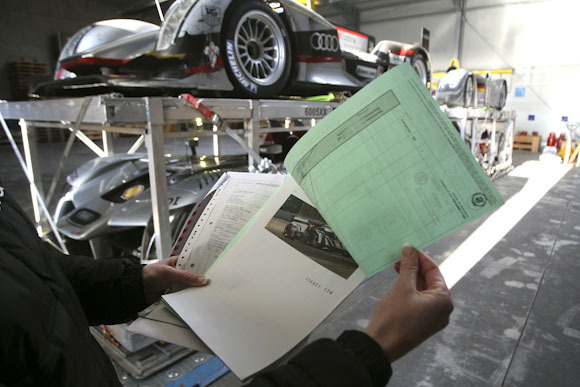 A set-up and dismantling team travels to the 6-hour races a day earlier to receive the shipment and to set up the garage, and stays a day longer to dismantle the equipment after the race. Consequently, an event may last between ten or twelve days for some team members, depending on the location. The new Audi R18 e-tron quattro will be running in eight World Championship rounds in Europe, Asia, North and South America in the 2014 season. The logisticians of Audi Sport Team Joest manage a sizeable cargo volume, 38 tons in fact, that must be transported around the globe. This is where that saying, ‘a place for everything and everything in its place’ begins to make sense. While the team has been testing for the 2014 season since January, for the logisticians, the new year actually started in December because immediately after their return from the last round of the 2013 season in Bahrain, they had to start preparing for the new season. The first race of the 2014 season takes place at Silverstone on April 20, and this will be followed by the Spa 6 Hours in Belgium two weeks later. Four weeks after Spa, on the first weekend in June, the team will require the material on the test day at Le Mans, where the 24-hour race will be held just 14 days later. 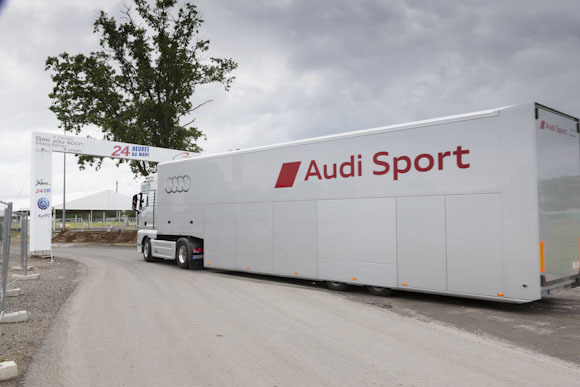 Within Europe, the entire hardware as well as the race cars of Audi Sport Team Joest will be transported by road. Audi will prepare three hybrid sports cars for the races at Spa and Le Mans, but for the other WEC rounds two R18 e-tron quattro cars will be used. The FIA World Endurance Championship has set up a logistical infrastructure for all the teams and will be moving about 200 tons of components to the events by cargo aircraft. At those ‘fly away’ races, it is the WEC’s responsibility to deliver the (unbranded) freight containers from the docks/airport and so all vehicles are unbranded for all the teams. In addition, some material, time permitting, will be transported to individual races by sea freight but of course the despatch of these items must be carefully planned and timed to ensure they reach the destination where you want them, when you want them. Starting in Europe, a distance of about 49,000 kilometres will be covered by these components in a single season as they travel around the world. In addition to the race cars and the spare parts, tools – from a humble wrench through to sophisticated lifting platforms and other garage infrastructure – must all travel by air. The team members stow around 36 tons of materials in 176 flight cases – these are rugged containers that are typically equipped with casters for ease of handling. This means that, together with the race cars, about 38 tons of equipment is packed on 19 aircraft pallets. Such logistics must happen race after race, year after year. Judging by Audi’s success in endurance racing since 1999, amassing an astonishing twelve victories in fifteen years in the Le Mans 24-Hour race, Audi’s global logistics team must be getting the right bits to the right address. So the next time a summer vacation is scheduled on the family’s annual calendar, spare a thought for those guys who must move tons of racing equipment with absolute precision timing. Some positive forward planning then for the family holiday may not go amiss. This is a precise description of a logistical activity which is overlooked in reports of motor sport events. There the accent is on glamorous aspects and human backgrounds of participating drivers. Glen’s blog highlights the necessary efforts by the motor industry to achieve superior results.